EXOR’s Net Asset Value (NAV) at December 31, 2012 was €7,620 million. This is an increase of €1,300 million (20.6%) from €6,320 million at December 31, 2011. 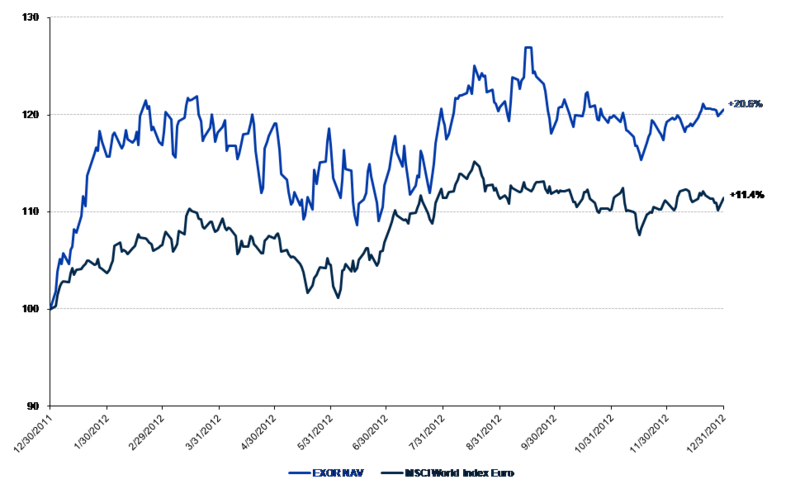 The gross asset value at December 31, 2012 has been calculated by valuing listed investments and other equity shares at trading prices, and other private investments at fair value determined annually by independent experts and other private investment holdings (funds and similar instruments) at the most recently available fair value. EXOR ordinary, preferred and savings treasury shares are measured at share trading prices, except ordinary shares used to service the stock option plans, which are measured at the option exercise price if lower than the share trading price and the shares granted to recipients of the stock grant component of the new incentive plan approved on May 29, 2012 by the shareholders’ meeting. The latter are deducted from the total number of treasury shares. 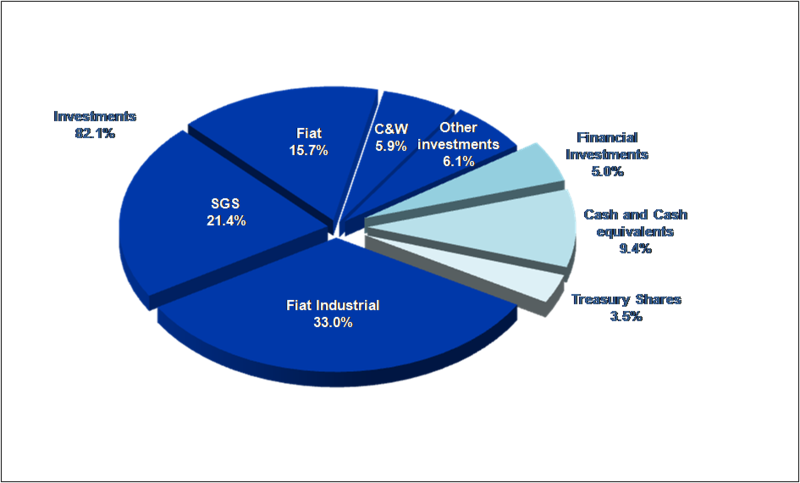 The following pie chart shows the composition of the gross asset value at December 31, 2012 (€9,178 million). “Other investments” include the investments in Juventus Football Club, Almacantar, Gruppo Banca Leonardo, Sequana, Banijay Holding, The Economist Newspaper and also sundry investments. Investments denominated in Swiss francs, U.S. dollars and Pounds sterling are translated to Euro at the market exchange rates at December 31, 2012 of 1.2072, 1.3194 and 0.8161, respectively.